"I got the chance to do it, so I'm on the list forever now." Just minutes into last night's game between the Brooklyn Nets and Los Angeles Lakers, LeBron James drove the lane and cocked back his right arm to throw down one of his patented dunks. According to ESPN Stats & Info, it was the 1,850th time he'd gone up for a dunk in his NBA career - and only the ninth time that he was turned down at the rim. 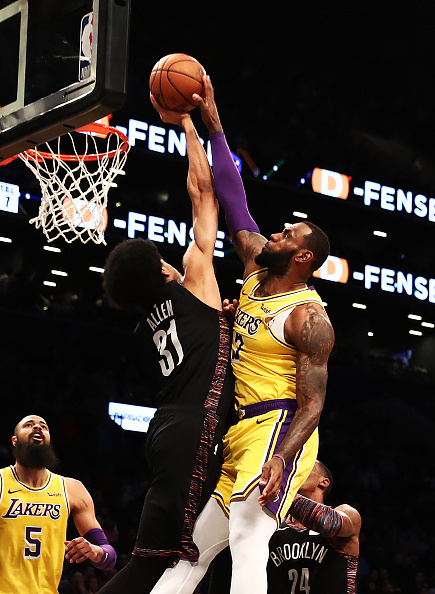 As seen all over social media, Nets center Jarrett Allen came up with the huge rejection, making him just the eighth player to ever block a LeBron dunk in his 1,850 attempts. "If you go up and you block it, you're going to be on the highlight," Allen said after the 115-110 win, per ESPN. "You get dunked on, you're going to be on the highlight. So just go up and protect the rim." "That's a helluva list to be on. He's an amazing player," said Allen, 20. "I got the chance to do it, so I'm on the list forever now." "He's in his 20s; I'm in my 30s," James said. "It takes me a little longer to get warmed up. But that's fine. I mean, you're a shot-blocker. You should, you can, get a block. It happens. It's probably all over social media, so that's cool." Nets coach Kenny Atkinson said Allen's block was a "statement" that got the team, and the home crowd going early. "I thought that got us going," Atkinson said. "I thought that got the crowd going. I thought he made a statement with that block." Last night's victory marked the Nets' sixth straight win as they've now improved to 14-18 on the season.